In light of Prince sadly popping up to the stars on Friday/because it was a rad excuse to dig out my Purple Rain vinyl & inflict it on the kids/because our Abel & Cole veggie box delivered us a big bag of them that urgently needed eating, we settled on using our purple potatoes. My kids are strange, in that they will happily devour mountains of raw greens or pull apart big scary prawns, but aren't very happy about eating potatoes in any form other than deep fried. Blue chips seemed like a cop out, so we thought we would experiment with a purple gnocchi supper. In an ideal world, your first step would be to bake your purple potatoes for 45ish mins, then scoop out the flesh into a bowl. This retains maximum purpleness and keeps everything nice and dry. We were nowhere near as organised, and only had 30 mins before tummies were going to start demanding to be filled, so we peeled, boiled and drained ours extremely well. Both kids are very into peeling veg at the moment, because they are mad, so loved labouring over each potato whilst I silently panicked over how long it was taking them. Once your potato is skin free, cooked and in a bowl, whatever the method, mash well and add 1/3 cup of flour - we went gluten free with Doves Farm's plain gf blend, but I reckon rice flour would work well or you can use regular plain flour if you're not fussed about gluten content. Also add one small egg - cracking the eggs is easy and fun for kids so I always let them do this bit and they rarely get egg everywhere or any shell in the bowl. Add a couple of pinches of salt (& pepper if you like). 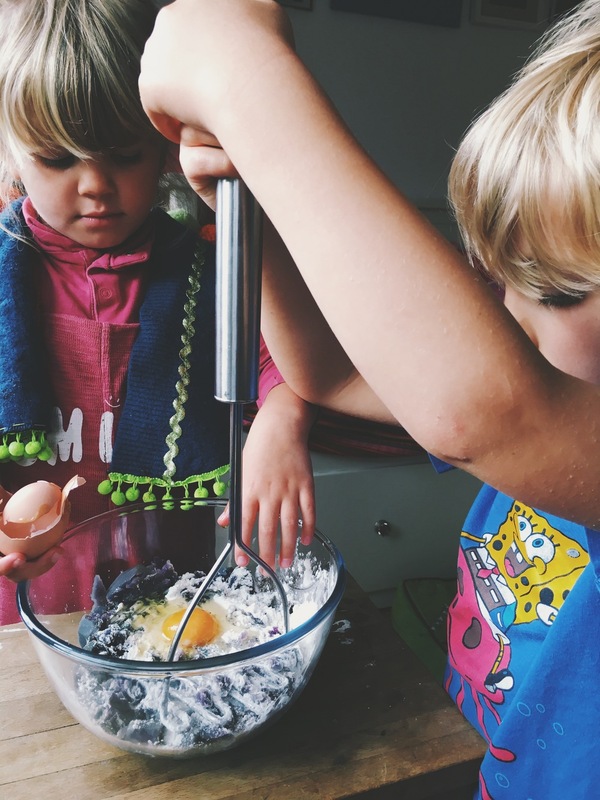 The mashing of the ingredients is another bit the kids can totally take over on. Basically with this meal they are doing the lot, so you can sit back and relax (unless you are too busy taking pictures, like me....) The mixture quickly comes together into a lovely satisfying dough which Indy very accurately compared to play doh. Separate into 4 separate pieces and roll each one out into a long snake - another job for the kids - then cut each snake into bite size nuggets. The texture makes this a really easy job for the kids to practice using a proper knife, and much was their glee at being trusted with something sharp and grown-up. Once the nuggets are chopped, roll a fork over them to make them look lovely and authentic and gnocchiesque. Or, if you are doing this with kids, give up on that and accept that they will all be totally different shapes and sizes and degrees of squashedness, but will nevertheless taste the same.